If I had kids, I would totally steal this idea and use it for their class Valentines. The Friday before Valentine’s Day is always the day you celebrate at school. 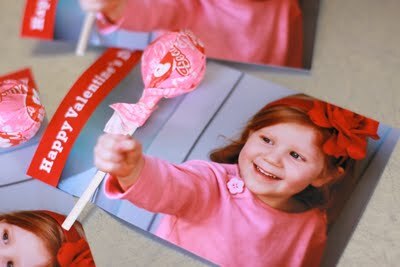 For younger kids, they get tons of candy and treats and give Valentines to all their classmates. For high school kids, they are all about the roses, stuffed animals, and balloons. I remember my first year teaching at my current school the principal made all the kids keep their balloons in the main office until the day was over. Every time I walked in there it felt like V-day exploded all over the otherwise dreary room. Last year I was the freshman class sponsor and we sold roses for little love birds to give to their objects of affection. This year it seems that Valentine’s Day has mellowed. I haven’t seen any balloons yet, only one rose, and one stuffed animal. It might just be too early in the day, but I think this year, Valentine’s Day is stuck in the snowstorm on the East Coast. Those are amazing. How do they do the 3D, is it just good photography? Yeah, great photography of the kids holding out their hands and then she punched holes to slide in the lollipop stick. Love it!